This page will provide an glimpse into some of my projects and other activities. I finally had some business cards made, not being content with just any card I had Martin Schröder in Berlin print them. While the cards come with a very nice wooden box, it doesn't work so well to carry around in your pocket so I designed and printed a quick little case. If you are interested in making your own version, my design is public and can be found here. Note that my cards are slightly shorter than what is standard so you might need to adjust the model. As an example of some of the analysis I can do I have created a detailed FEA model of a 3D printer hotend, which is the portion of machine which melts the plastic before it is extruded out onto the build platform. While there are numerous images of hotend models floating around the internet they are, as is usually the case with FEA models, only pretty pictures and not actually useful. The model I have developed differs in a number of aspects. It is transient, meaning a time dependent, while the other are steady state. This is important because while hotends operate in a quasi-steady state, it requires much more accuracy in the model to match transient behavior and having a transient model allows for exploring time dependent phenomena which are naturally unavailable with a stead state model. The model has also been correlated to the performance of a physical prototype, now that that has been accomplished it may be used to explore variations and gain a deeper understand for internal behavior which is not easily observed . Without correlation, particularly with a thermal model which has many variables with the boundary conditions, the proof of validity of an FEA model is very much limited. The model also considers and accounts for the energy lost via exstruding plastic and the energy required to change phase from solid to liquid. The results of the model are useful and important not because they are surprising but because they reflect what is observable. With a working prototype we have one example of a configuration which works but can not always extrapolate that into other situations. An example of this would be determining how fast can we feed plastic into the hotend before we can no longer maintain temperature. You can do this with testing but it is easier and less messy to simply change a few numbers, hit run and check out the results plot a few minutes later, and at the same time you could also shorten the heating block, change the nozzle size or make other changes which are no so simple in the physical world. The following plot shows a temperature and power plot for one configuration of the hot end. It shows the steps of operation which are: heating, steady state, and then extruding plastic, which in this case is allowed to run for 10 seconds before adding additional power into the system to check that the system response is in lines with reality. This is the dip and them return to temperature seen at the mid point of the plot. The plot above shows an example of the hotend in operation. The power is input via a resistant heater with a max of 30W and the heat leaves the system via surface convection (forced and natural), via the phase change energy required to melt the plastic and the energy carried in the heated plastic which is extruded. The convection heat transfer is a function of the temperature difference between the surface and the surrounding air while the other energy loss is dependent on the rate of printing (and operating temperature). The calculations of energy loss via extrusion and melting are shown below. 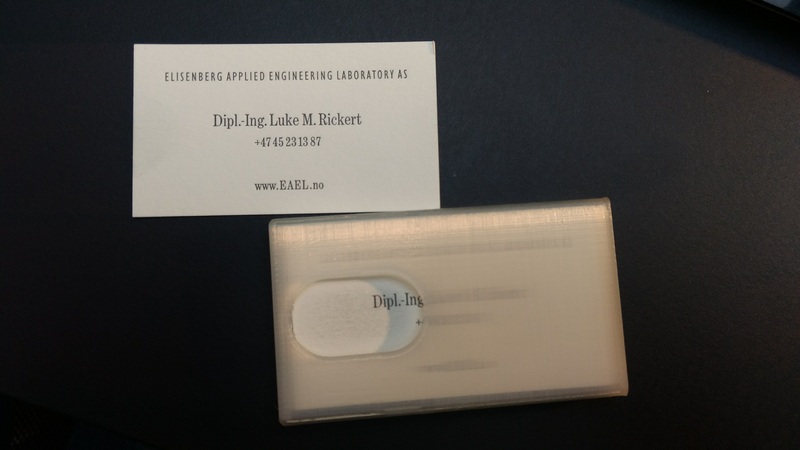 This is simply an example of one print rate, nozzle size, extrusion width, and print temperature. Other configurations would naturally require re-running of the model with different heat-fluxes. The model was run both with and without plastic inside the nozzle. 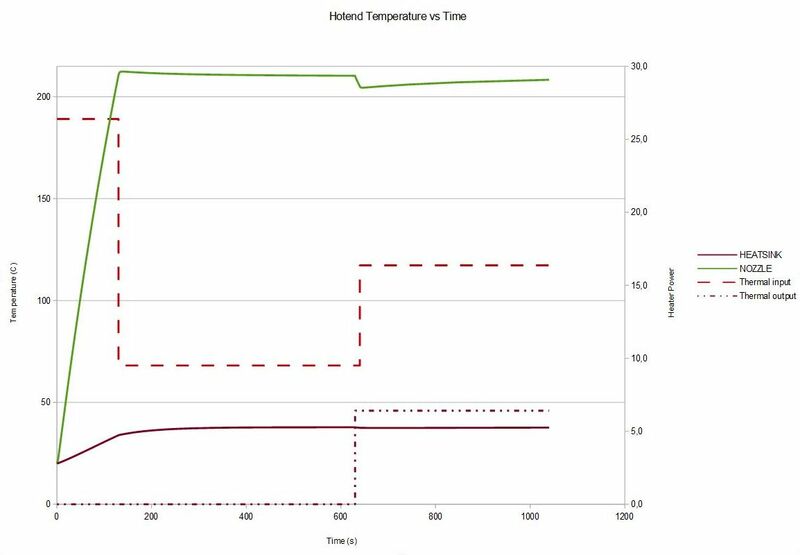 The following shows how the temperature in the plastic follows the adjacent temperatures and therefore it is left out to simplify the modeling by taking note that it does lag slightly behind in terms of temperature response. And finally the full run, but not real time as that would take over 17 minutes and it really just isn't all that exciting. If this goes by too fast for your liking, youtube allows you to slow down the replay. 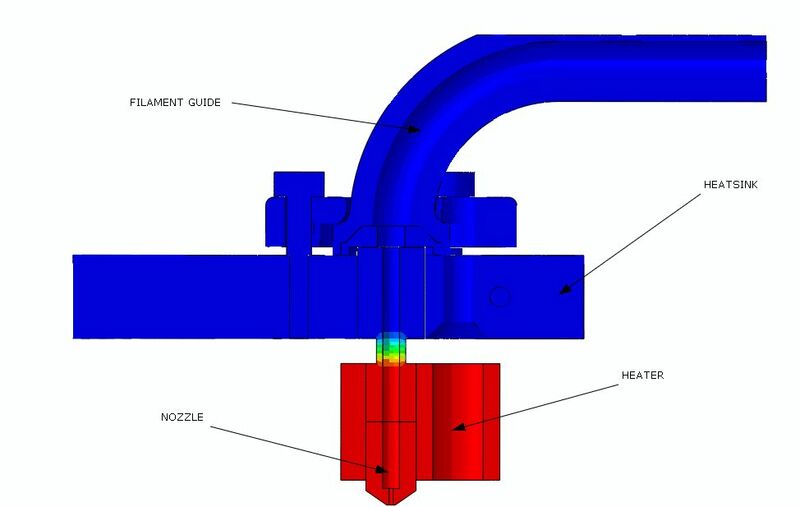 There is more work that could be done with this model, including such factors as adjusting the heat flow to account for the thermal expansion of the plastic, adding radiant heat transfer between the components, and adding plastic back into the nozzle area. The main point of this example is that the model runs, provides reasonable results and therefore it can be used as needed to explore such things are print speed limits, heat up time, changes in heat block length and other variations much more quickly and in someways more clearly than building physical prototypes. As part of owning fine "vintage" machine tools there is a certain amount of maintenance and rebuilding that is required to keep them in top condition. Part of this process involves what is called "scraping". This is most simply put as the iterative process of flattening and alignment by the removal of material using a scraping tool, marking media and a reference surface. While it can be applied to range of materials, cast iron is the most commonly worked using this method. It can be used in place of or in addition to grinding processes and also aids in the retention of lucubrating oil on sliding surfaces. As I have a course coming up shortly I have started acquiring the necessary equipment. 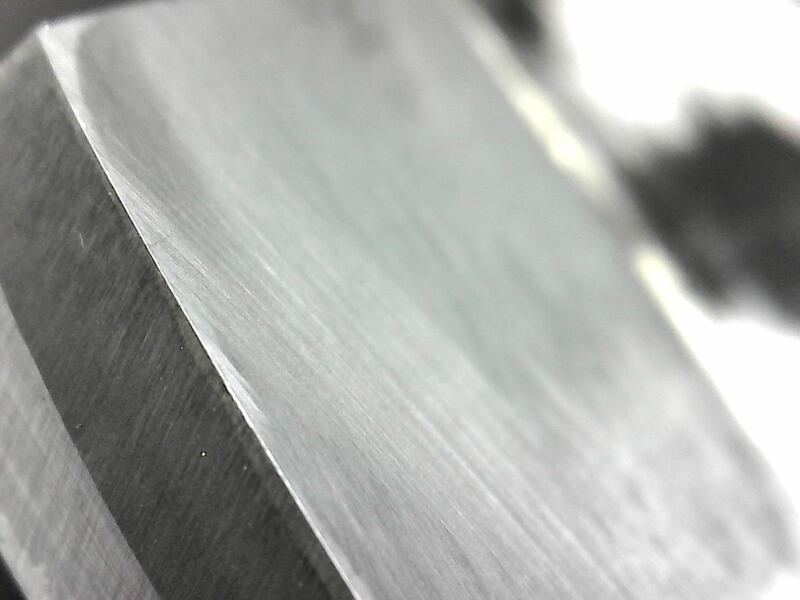 Although back in the "day" craftsmen used a scraper ground from a file and sharpened with an oil stone, the modern application of these techniques uses tungsten carbide cutting edges as they stay sharp much longer than HSS. The big catch, and probably much of the reason they did not catch on until most recent times is that getting carbide sharp enough to scrape properly is non trivial thing. To do this it requires very fine diamond grits (at least 1200). My process is to use a 120 grit diamond wheel to shape the scraper and then the new lapping machine with a cast iron rotor loaded with number 7 compound to polish the edges to a mirror finish. As doing things the hard way is often how I proceed (or on grounds that said activity is educational) I decided to make a lapping machine rather than buy one. The requirements are rather simple, a slow turning cast iron disk and an adjustable table to set the desired angle. It doesn't require much power and the run-out etc not super critical. The spindle is a conventional design with a cast iron body with a steel spindle and some random bearings I found in a box. The cross section looks something like the following. The forward two bearings are fixed both together by the spindle shaft and on the outside by the locking nut. The shaft can float in the rear bearing as it only needs to react bending loads. The model is online here. The resulting machine uses 3D printed plastic for the non critical structure. This is practical as it performs fine and is far easier and quicker than any other method. While making the body out of cast iron etc would be nice it is ultimately unnecessary. 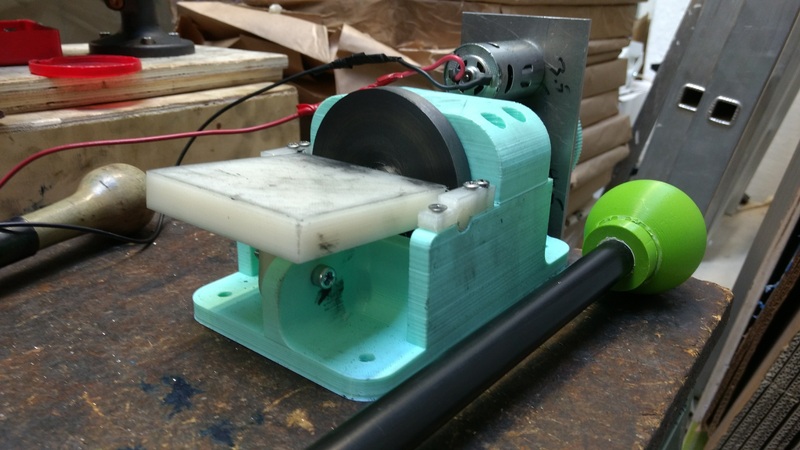 The cast iron rotor was loaded up with 1200 grit compound and a power supply attached to the salvaged motor as a test. It works but sounds terrible and it will be replaced with a smoother running belt and sewing machine motor when it arrives. All that really matters is how it works and that is actually quite well. 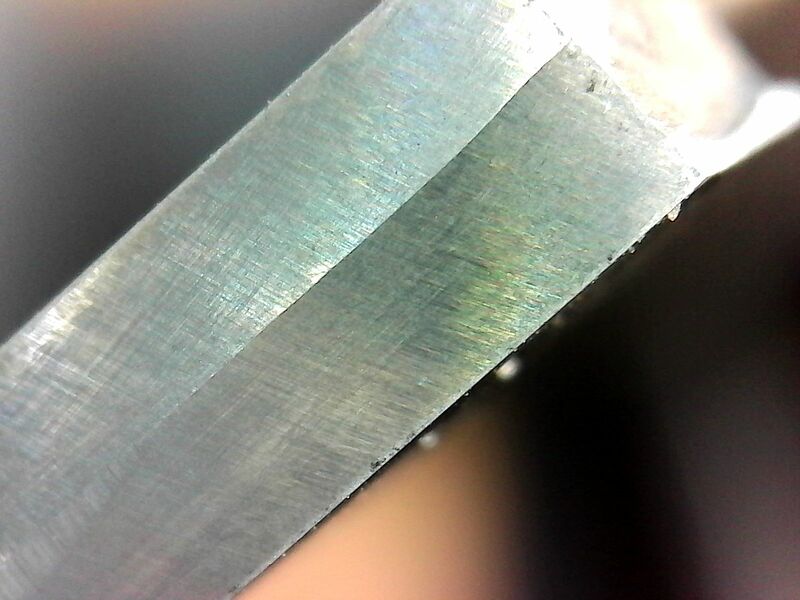 The following are close ups of the polished edge. 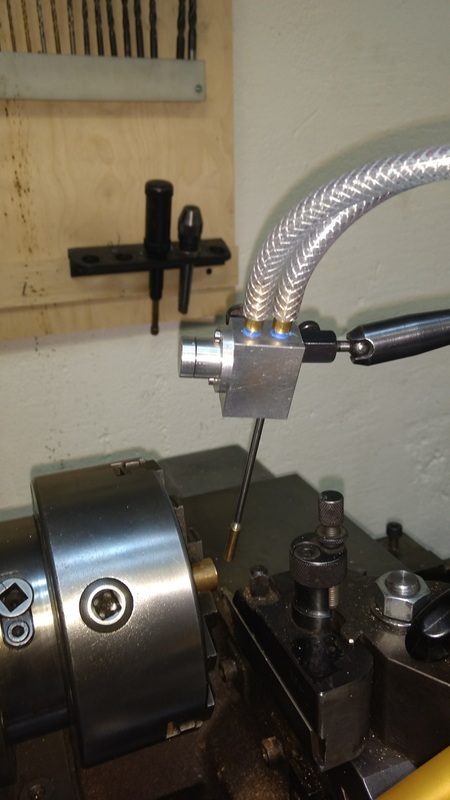 Based on an existing concept I designed and built a MQL system to use with my machine tools. MQL is appealing as it offers some of the advantages of other coolant systems (such as flood) without the mess and other hassles. The fundamental ideal is that the liquid coolant and the feed air are at the same pressure and therefore it will eject droplets rather than a fine mist which will enter the air. 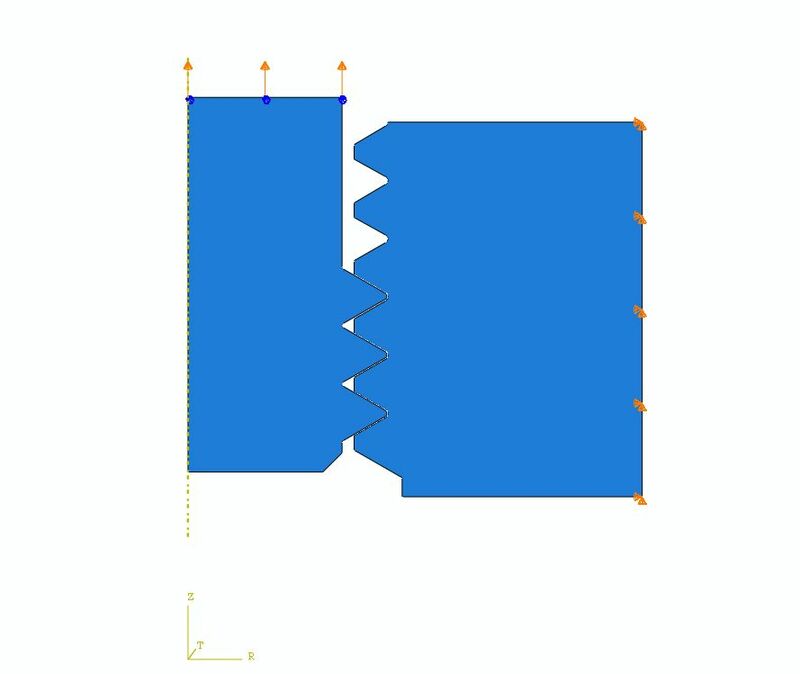 If you would like to explore the model in more detail it is posted on onshape.com. Construction is straightforward other than making a special cutter to form the needle valve seat. As simple an example of the Finite Element Analysis this section will outline a study of a large bolt and nut loaded in tension. It shows one interpretation of limit analysis where the capacity of a structure may be estimated using a quasi-plastic stress strain relationship. The model is run as an axial-symmetric model which is a highly efficient means of modeling structure which is symmetric (or sufficiently close as this fastener is) to symmetric about an axis. The bolt portion of the model is loaded via displacement (0 to 2mm) in the vertical direction while the nut is held stationary. A displacement loading is generally more stable and robust than a force loading and as it is ramped evenly over the time period creates a direct ship between time-step and position which can be convenient. The material used for this model is a low near soft 17-4 PH stainless steel with a yield of 1000 MPa which is still a very high strength material. The modified stress strain curve is shown below. This curve does not take credit for strain hardening or other plastic effects. The following plot illustrates the difference between a plastic (typical) and limit curve. By using a material model with no strain hardening it is conservative and allows for redistribution of the load as components begin to fail. Although as the criteria used for failure is the point at which the model begins to experience plastic strain this non-linear behaviour is not of great importance to the model's results. The following image shows the state of the fastener at 2mm of displacement. This is well past the limit of the material for actual application. There are various approaches for evaluating where this limit is but it will be shown to be well below this point. The load that coresponds to this state is 810kN with a nominally 41mm bolt. The slope of the force vs displacement line is directly related to the stress strain curve and therefore indicates the effective stiffness (or modulus) of the material. When that stiffness diverts excessively from the quasi linear slope it shows that the structure has failed. The exact capacity of this structure is matter of considerable debate depending on the particular situation, requirements or installation specific standards. If significant margin is desirable and a small amount of extra structural material is not problematic then the point where the slope leaves the nominally horizontal plane would be an acceptable, this is approximately 0,4mm which corresponds to about 750kN (75 metric tonnes). The following animation shows the stresses as the displacement is applied.